Florida– Mjelaw Logo Design Mjelaw Logo Design based MJE LAW Firm hired us to create a compelling logo for their law firm. There were 3 logo designs created for this client. The winning logo features a globe with a cursive MJELAW in the center, a boxed text of the law firm’s slogan “straightforward solutions to complex legal issues” and 5 stars in the bottom to reflect the law firm’s high quality services. The new logo design is pretty straightforward just like the legal firm’s services. LAW Firm hired us to create a compelling logo for their law firm. There were 3 logo designs created for this client. The winning logo features a globe with a cursive MJELAW in the center, a boxed text of the law firm’s slogan “straightforward solutions to complex legal issues” and 5 stars in the bottom to reflect the law firm’s high quality services. The new logo design is pretty straightforward just like the legal firm’s services. 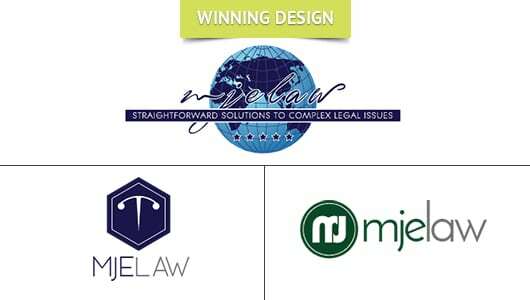 Florida-based MJE LAW Firm hired us to create a compelling logo for their law firm. There were 3 logo designs created for this client. The winning logo features a globe with a cursive MJELAW in the center, a boxed text of the law firm’s slogan “straightforward solutions to complex legal issues” and 5 stars in the bottom to reflect the law firm’s high quality services. The new logo design is pretty straightforward just like the legal firm’s services.